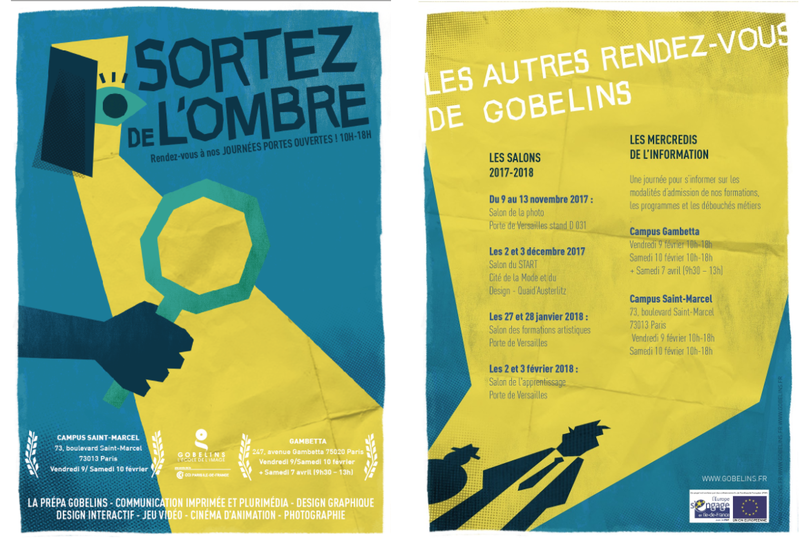 Second project at Gobelins. We have to work on communication for the school’s JPO ( journées portes ouvertes ). Takes us back to Graphic Design, since the last workshop was more about filmmaking. Brief is : One flyer, One video. Theme is : “Cult movies”. Groups were randomly made and I’m lucky enough to be working with Garance and Aslin. I was looking forward to work with Aslin because it meant practicing english and getting to know her, and Garance being a close friend of mine everything was pretty convenient. I usually take care of organizing and planning during projects, Google Drive is my weapon of choice. Checklists, moodboard and all kind of research and notes land in there. Archiving everything. Based on our discussion around Cult movies, we decided to work on a fake trailer for a fake polar movie. Debating was very interesting since Aslin is from Taïwan, we could exchange and mix cultural references. We quickly agreed on artistic direction, our main inspirations were Saul Bass, since he worked on movies considered being cult and papercut style seemed nice to work with; and Tom Purvis, who has a more illustrative and textured style, allowing us to play with materials. We also quickly found some motion design references using the style we felt most interesting and comfortable to work with. Next on the list was to design the flyer. We wanted it to be the poster for the fake movie of our concept. 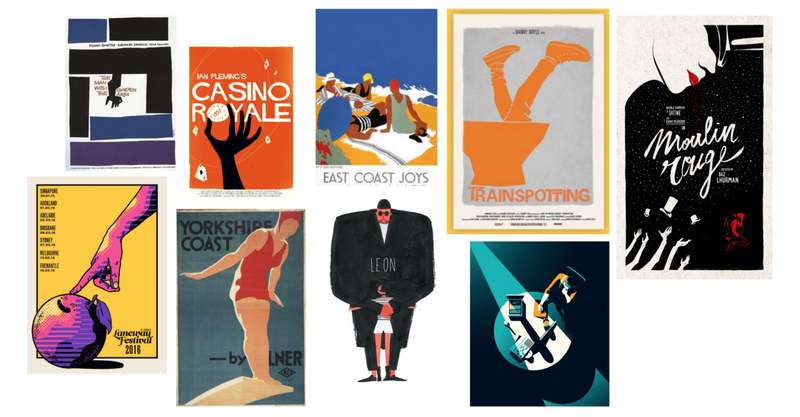 Using graphic codes and rules from movie posters. We started with sketching and trying out colors. Everybody trying out composition and textures. Handling text was complicated since Aslin wasn’t familiar with latin alphabet. 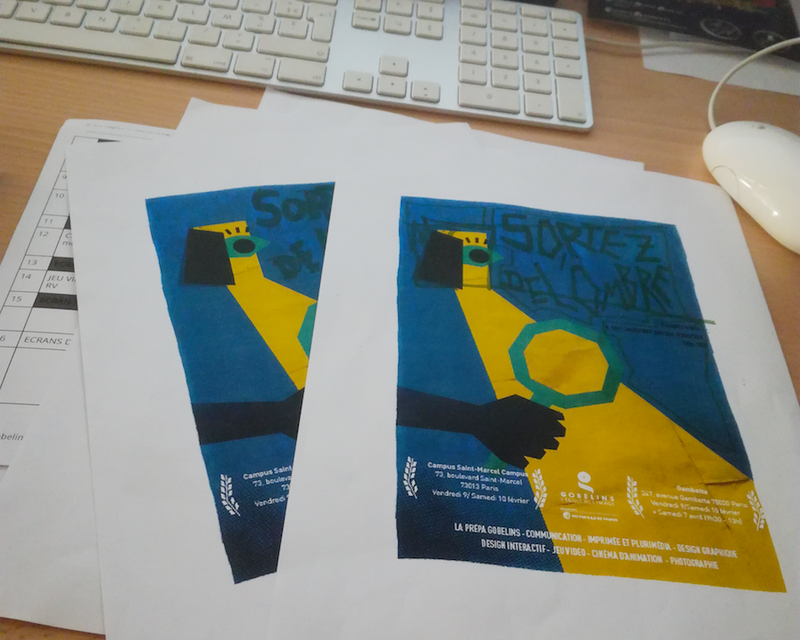 We did some printed tryouts and a lot of corrections. We eventually agreed on a final printable design. Next thing was to think about the project animation wise. We agreed on a scenario and quickly did a storyboard, then a motion board to have an idea of the rythm and linking between the scenes. 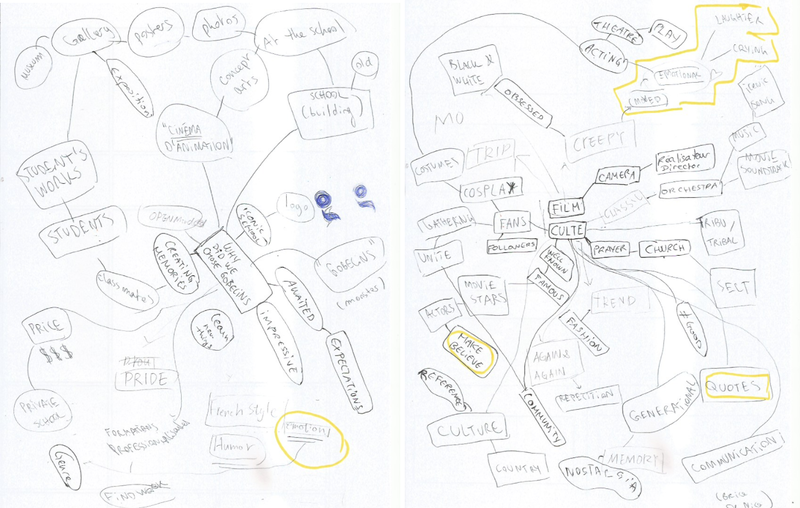 Garance’s cleaned out story board ! We carried on, working on still frames, preparing files so that when we came to animate them, we’d save some time ! We have a lot of different scenes so it meant as many still frames as scenes there were. From there we just split the amount of work between us three. We had different levels of knowlegde software wise and did our best to balance everything. My main goal when working with groups is to save energy and never overwork. To do so we have to be aware of each teammates capacities and prepare a precise schedule. One of our shots involved some cel animation. 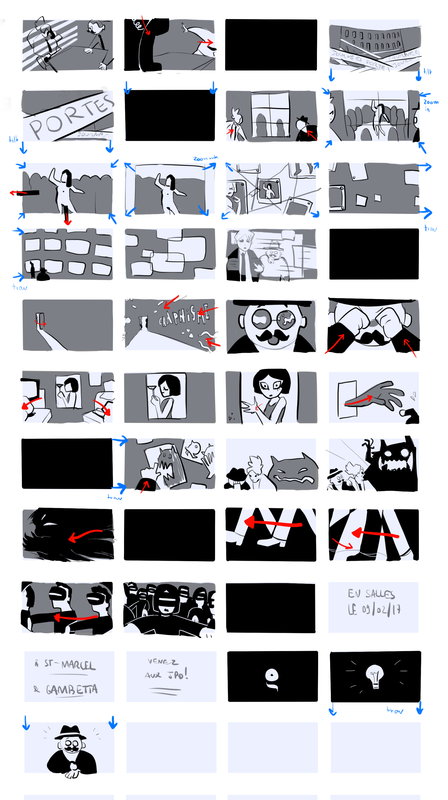 I was the one to tackle this task, working from the two storyboard key frames to the final 95 frames animation. It was very hard to get the timing right because the frame per frame animation was done on Adobe Animate where all the rest was on After Effects. Timing is also about sound design. We had a hard time finding a voice actor and scheduling a recording session. We ended up working with some friends' and our own voices. None of us are professional comedians, making the final result sounding a bit of amateur. Still, we had a blast doing it. Thanks again to Tim and Aurore for landing us their voices. Incidentally, we also had to take care of music, sound effects and mixing the whole thing. We used one of Kevin Macleod’s track and a lot of free to use sfx. The final version which was also posted on the school’s youtube channel ! The project has a Behance page right here and we were also lucky enough to be retweeted on Adobe France’s twitter account, which made us really proud.